The Last is a mystery novel from Hanna Jameson. I was not expecting such a post-apocalyptic novel! What intrigued me the most before reading The Last was the "Agatha Christie meets Stephen King" quote. There was just no way I was going to pass that up. First of all, I didn't find Agatha Christie or Stephen King in the pages, but it's a cool quote. 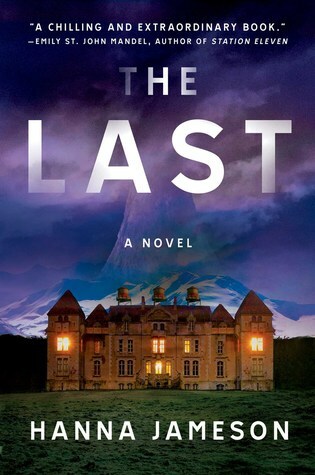 The Last is a mishmash of mystery and apocalyptic fiction, though. I want to be clear - I loved this book. I do feel like it wasn't sure what it wanted to be most of the time. I know what I wanted it to be - a pure post-apocalypse. I loved the world of The Last, and I could have stayed there much, much longer. There were so many aspects that could have been expanded and explored. The framework of the novel was a mystery, though, and the apocalypse was one hell of a setting! This was my first experience with Hanna Jameson's work, and it definitely won't be my last. She crafted something really great not just with the setting but with the characters as well. More than anything, The Last was about the characters and the relationships they built while the world was ending. In the end, I'm giving The Last four stars instead of five simply due to the unexplored/unexplained aspects, but I still highly recommend reading this one. Oh my gosh I need this. Going to buy it NOW. I'm so glad to see some positive reviews about this book and that other people are enjoying it. It's a great book! Thanks for sharing. I definitely need to check this one out! Awesome review! Thanks! Yes, it's worth the look!